Golfers are a demanding lot. We all want more distance in our drives. (Who wouldn’t want to step up to the tee and belt a 300-yard drive?) We want pinpoint accuracy, so we can put the ball right where we want it when we want it. And we want lower golf handicaps. Yes, golfers are a demanding lot. Unfortunately, distance and accuracy don’t always go together. If we want distance, we usually have to sacrifice accuracy. If we want accuracy, we often have to sacrifice distance. Right? Wrong. You can achieve more distance without sacrificing accuracy by finding the right combination of loft, clubhead center of gravity (CG), shaft, and golf ball. Let’s review each of these components before discussing how to combine them effectively. We call it getting dynamic in my golf instruction sessions. Doing so will not only generate more distance without giving up accuracy, it will produce lower scores and improve your golf handicap. Driver loft is the single most important factor when it comes to distance. Because backspin fights off sidespin, golfers often find distance and accuracy in a club that features more loft. The more loft in the club, the less your shot will curve right and left, allowing you to hit more fairways. Golfers who lack loft on their clubheads usually lack consistency and accuracy off the tee, which can cost strokes, especially on courses with tight fairways and/or deep roughs. 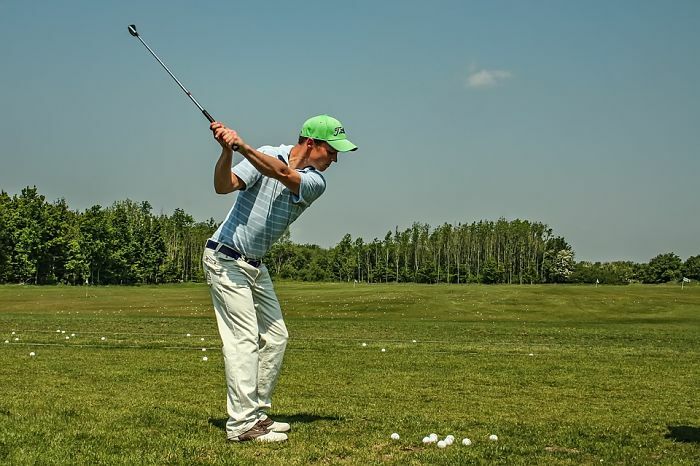 Instead of hitting from the fairway for your second shot, you’re hitting from the rough. But using a driver with additional loft provides more distance without sacrificing accuracy. If loft is the most important element in distance, CG is not far behind. CG is the point on the head of a golf club where it’s perfectly balanced. The position of the center of gravity within a clubhead affects the trajectory of shots. A CG position that’s low and toward the back of a clubhead, for example, encourages a higher trajectory. When the club sits according to its design, CG encourages the face to rotate properly. The natural rotation of the face through impact is what causes a ball flight that curves slightly from right to left. CG location is critical when trying to make consistent contact with the ball and generate more distance and better accuracy. Shaft is another key element. Measured by a machine, shaft frequency is the number of times a shaft oscillates either vertically or horizontally. The units of frequency measurement are known as cycles per minute, or CPM. A shaft with a higher frequency (more CPMs) is stiffer than one with a lower frequency (fewer CPMs). By using frequency to compare shafts, you can tell which shaft is stiffer and by how much. Usually a player with a fast swing requires a shaft with less flex. Those with a slower swing needs a shaft with greater flex. In addition, today’s shafts are made with specific launch characteristics in mind. While flex is important, the launch parameters of a shaft keys how far a ball can be hit. Composite shafts allow for manipulation of “kick points” to create specific launch angles for each shaft, which is great for generating distance. Far too many golfers use the wrong golf ball, as I’ve often pointed out in my golf tips. A ball impacts your game almost as much as your clubs, so it’s important to choose a ball that’s right for you. Factors to consider are things like spin, durability, and control. If you have a high golf handicap, for instance, you’ll probably be looking more for distance and durability in a golf ball than spin and control, so a good two-piece ball is probably best. This ball has a harder cover, and creates less backspin, which enables you to hit it farther. Finding the best match between all these elements is called launch angle optimization. And the best way of achieving this is using a launch monitor during a session with a professional club fitter. The session will consist of your hitting different golf balls with drivers having different lofts, head designs, and shafts. You’ll also hit your current driver for comparison. The fitting session usually takes about 30 to 60 minutes. When it’s done, you’ll have the right set of dynamics to drive the ball farther than you ever have without losing any accuracy—and that’s bound to help not only your scores but your golf handicap.